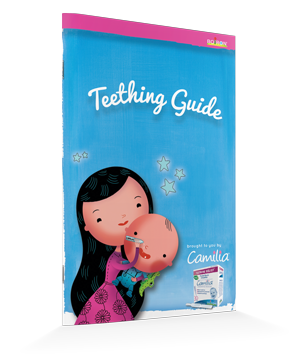 Camilia is a worry-free baby teething solution that provides targeted relief of painful gums and irritability. It consists of plant-based homeopathic medicines that will not numb the baby’s gag reflex or interfere with nursing. Simply squeeze the small pre-measured dose into the baby’s mouth. The clear and tasteless liquid is absorbed sublingually. Camilia is available in boxes of 15 and 30 single-use liquid doses. Snap off one single-use dose. Twist to open. Squeeze entire contents into mouth. Repeat, as needed, every 15 minutes for 2 more doses. If or when symptoms return, repeat these dosage instructions for up to a total of 9 doses per day. Stop use and ask a doctor if symptoms persist for more than 3 days or worsen, or if inflammation, fever, or rash develops. Store at 68-77° F (20-25 C). Sign up for our Wellness Naturally e-newsletter to get access to this awesome teething guide, plus receive monthly e-mail updates with health tips, recipes, coupons, and more!